One person who always gets me thinking is Donal Daly. Last week I interviewed him about his new book, Digital Sales Transformation in a Customer First World. The collision of two major mega-trends that change everything. What to do to ensure your sales organization can compete and win. Listen to the mp3 of my interview here. We talk about the two trends, emerging technologies (AI), being totally customer-centric, and thinking! Listen to the mp3, download the PDF or read the transcript below. Hi there, I'm Jill Konrath, and I'm here today with Donal Daly. He is the author of a new book called Digital Sales Transformation in a Customer-First World. And let me just say that Donal knows what he's talking about. Yeah, well ever since I met you, I’ve felt that way and that was many years ago now. I think we first met at Dreamforce, right? We talked online before, but I've always been impressed with how you were such a forward thinker in terms of what was happening in the sales environment. And, you’re also the Chairman of Altify, a sales technology company that helps salespeople win more deals faster – by helping them do the right things so they can be more successful. That's right. We've been on that journey for a while, before it was cool. Way before it was cool. I remember at Dreamforce when you first tried to explain it to me. I could not get my head around the concept. What you were doing at Altify five or six years ago was way ahead of its time. And, you’ve gone way beyond it since then. That’s true. Our vision was to make the life of salespeople better—using software—to help them win deals and get more from their existing customers, by fundamentally helping their customers. I'm glad that's come to pass now, because it's the only idea we had. Well, that's good! What I was most impressed with back then was how your software actually prompted and helped salespeople advance the process. Almost like, "Did you remember to do this? Or, if you're smart, here's what you do next." It was like a built-in coach in terms of guiding people through the process, making sure they didn't miss any steps, right? That's it. And it's one of the benefits of being as old as I am. My first company 30 years ago was in AI (artificial intelligence), before AI was cool. And then it wasn't cool for 25 years, and now it's cool again. Yeah, it's very cool again. It's all about helping improve human performance, and we apply it to sales. I think salespeople in the whole marketplace are really ready for that kind of stuff right now. I think so, and I think their customers need them to be ready. That is so true. We're going to dig into your book right now, because one of the things that I noticed is in that book, you talk about two mega-trends—#1) Customer First and #2) Digital Transformation. You want to talk more about those? Because those are pretty meaty terms that may not be understood by everybody. We'll start with "Customer first.” I think what's really important here is that it's always been about the customer. People would agree intellectually, then say to me, “But Donal, I need to go close my deal and make my quota." You do, but you know what? You don't have a choice anymore. Today’s customer is so empowered, they have so much information, and they're so well equipped with the knowledge and what they learn from everybody that if you don't actually truly believe that you can deliver a benefit to the customer, you're not going to succeed. I think that's a good thing, but now it's not something that you get to choose. Yeah, and let me expand on that. People always say, "Of course we do customer-first," but if you take a look at their actions, they are not customer-first action, they're self-serving actions. They are, "We need to get this deal closed by the end of the month," actions or "Do whatever it takes” actions. That isn’t customer-first. Nor is it customer-first if you go into meetings without preparation and without actually stopping to think about what is most important from the customer's perspective. If the answer to that is “Yes”, then you should be puffing out your chest and be really full of confidence. You're actually going to bring value to the customer. If the answer is “No”, there's no winner. There is no winner; the customer doesn't win. If you actually close the deal, then you're getting a short-term customer, and that's not a good thing. You know what pains me, is to see how so many companies invest so little time teaching their salespeople about the customer. People go, "I know what the customer is trying to achieve, I know what their goals are." They're kind of the easy things, because the last customer you spoke to, Jill, their goal was to grow revenue, reduce costs, improve profit, but you don't learn a lot. When people take the time to understand why the customer wants to achieve those things, and understand what's broken in the customer's business, then they begin to feel the customer's pain. That’s when they say, "Oh, I understand the impact on the customer of doing nothing, I understand the impact of the customer doing the wrong thing. If I can help them do the right thing, then that's a win for both of us." Let's talk about that second mega-trend, on digital transformation. You know I'm a nerd and a geek, right? You're a real nerd and a geek, and you love studying this kind of stuff. That makes me really happy, because then I don't have to go into the depth of research that you do on these kinds of things. Yeah, so did you know that in the world today, we've got 4.4 zettabytes of data? It's a lot. Think of a one with 20 zeros after it, there's actually 21 zeros after it. That's today. In 2020, it'll be 44 zettabytes. That’s a tenfold increase. And in that time, the data in the world will increase twice every 72 days. Oh my God, it's painful to hear that. I know, it is. And, because there's so much data, people say, "What do I do with all this information?" The reality is that there is not a data deficit, there's an insight deficit. So the challenge becomes how do we help people understand what data matters and what insights matters. And ultimately what they can learn so they can teach their customers how to improve their business? Every day, there's a new digital initiative going on in every large corporation in the world. 47% of customers in the world we surveyed do this. We surveyed about 1,000 different corporations and 47% have digital transformation as their number one disruptive threat. Not the number one strategic initiative, the number one disruptive threat. Disruptive threat. So it's all changing, and it's happening to customers, it's happening to salespeople. We need to figure out how to blend the best of the technology with a customer first perspective to optimize how a seller can deliver value to a customer. That sounds like a big chore. It is, but you know what, it's pretty simple if you break it down. Because if you think about it, customers like to buy in different ways. Customers like to buy different things. For example, if I'm buying copier paper, I don't need a seller to help me. If I'm buying an ERP system, then I need a seller to help me. If I think about, and there's so much data available that can tell me what the propensity is for a customer to be one of the copier paper buyer or the ERP buyer—then that should inform my customer engagement model and value delivery piece. Well, let's go back to the fact that this digital transformation is on everybody's mind. Why should we care about that as salespeople? Help me really get why I should care about it. You speak about crazy busy buyers, right? I do, And, I speak a lot about crazy busy sellers now too. The crazy busy buyers are crazy because they have to deal with so much data and insight and all those initiatives. If the seller doesn't understand that or doesn't understand how their solution or product applies in that context, they will lose. Sellers don't like to lose, so sellers should care about how the customer is transforming their business, and digital transformation. Let me just say this, this digital transformation is different than what we've seen with technology over the last 30 years. What technology has done over the last 30 years is make it easier for people to do the things that they did. Digital transformation does all that, but it also makes it possible to do things that people didn't think were possible before. Now they're coming up with new business models. From a consumer perspective, companies like Uber and Netflix fundamentally change business models. They're doing things that we didn't think were possible before. The same thing is happening in corporate land. Everything we do in corporate land is informed by what we've learned in consumer land, because all business people are consumers. So we can learn from that. They're thinking about how to do new things with technology, how to do new things that weren't possible before, and that's the landscape that the seller has to sell into. Definitely more challenging, but for the good seller, it should make you salivate in terms of thinking that, "Wow, what is possible with this magnificent transformation going on, and what can I do to stay ahead of the game?" Yeah, because I mean, as you know, for a seller, change is the biggest opportunity. Yes, absolutely change is the biggest opportunity, and most people don't even think about it, they just go, "Oh shoot, this change is going on in the organization." To me, the "Oh shoot" is really like "Oh yes", there is change, and change loosens the grip of the status quo and gives you a chance to come in there with fresh ideas, insights, and information that help buyers. Completely, and you know the crazy busy buyers are yearning for someone to help them. I think they are desperate for an intelligent person or group of people to come in and guide them, show them the way, ask them questions that they haven't thought about, and challenge their thinking. Right, yeah, enlighten me, right? Teach me something that I didn't know before that illuminates my business. Yeah, now you talk a lot about the importance of critical thinking. How does that all fit in your book and what we all need to know more about? First, I think critical thinking is probably the biggest challenge to knowledge workers—and salespeople are the most obvious example of knowledge workers, because all we do is think for a living. We don't produce anything. We think. You've heard me say before, thinking is very cheap, but if you don't think, it's really expensive. That's really good, so I want you to say that again. Thinking is very cheap, but if you don't think, it's really expensive. I think people have no concept of what is lost due to the failure of thinking, or the lack of thinking. It's a huge problem, because if Google is the answer to everything, then I don't need to think. But if Google is the answer to everything, then everything spirals to the lowest common denominator, and we all have the same answer. I think the challenge here is, how do we encourage people or entice people to think? We entice salespeople to think by asking provocative questions. Not provocative in an aggressive sense, but provocative like this: "If you were going to lose this deal now, what would be the number one reason?" I'm amazed at how many sellers I ask that question, they go, "You know what? I never thought of that." Right. Because then I say, "Because if there's no reason, you'll have the deal done, so think about it," and they'll go, "Yeah, it's ..." Then I say, "Don't say price, because it's not price," and they'll say, "Well, you know what? It's probably because somebody else in my competitive landscape has a better relationship with someone in the buying thing." I say, "Okay, that's really good, so what are you going to do about it?" I play a game with this. I say, "Think about it in your head, and you don't have to tell me your answer, but the answer you come up with is the wrong one." For example, if I were doing a presentation, I'd say, "So assume that when I'm finished speaking, you get a voice message on your phone to say you lost the deal. What would the number one reason be?" That's all we're doing, getting people to think about that, and I say, "Wouldn't it be better to think about that before you get the call?” because then you can take action. One of the things we're trying to do with our software is look at the data that's there, look at the knowledge that we know, and prompt those critical questions that says, "You've told me that your competitor is strong in feature A, and what are you doing about it?" "Oh, you know what? That's a good question, I need to do something about it." Failure to think about that will almost always lead to surprises. Surprises are never good, because then people would simply call you up and say, "You know Jill, we've decided that rather than spending $1 million with you, we want to spend $3 million." That's not the surprise I normally get, it's more like, "We decided to wait another six months, or we're going to go with XYZ company." Right, or, "We're going to spend $3 million, but we need to think about it because it's not in this year's budget, so it's going to be in 12 months' time." 12 months' time, that's painful. "No, we're going to put you in line of the things that we're going to do. You're not number one priority, but we're going to get you in the queue." "But we like you though." "We do," right, yeah. The thing that you're talking about is the importance of sales leaders having a system to ask people questions like that. A sales leader's job is really to get their people thinking, because sales is a thinking profession. Yeah, and I think that the need is even more prevalent today than it's ever been. The sales manager and sales leader have always been really important. 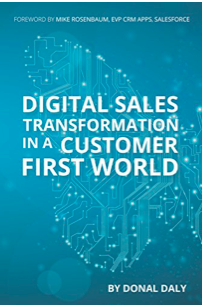 But because of the pace of change, the customer-first imperative and the digital transformation disruption, if the sales manager isn't holding their salespeople accountable to thinking about what they're doing, they will fail. Yes, they will, because they're doomed to repeat the same mistakes. First of all, they're doomed to create mistakes they don't need to create, which lead to losses or extended time. And secondarily, if they don't learn from it, it's just a repetitive cycle. Yeah, and it's no surprise that today, or in the last year, only 53% of salespeople make quota, which is the lowest number in seven years, and it's declining. Yeah, and particularly in the tech space because margins are so big and it’s always been so easy to hire more salespeople to fix the problem and make the number. So what happens? The law of math will say, fewer people will make quota. The opportunity though—and I'm an optimist—is that these things are really fixable. At Altify, and I’ll do a little 2-second plug, is that we’ve tracked independently the stock performance of Altify customers and compared it with NASDAQ and with S&P, and they're around about 23% better. It's not our data, it's not opinion, it's not subjective, it's what the markets say, because there's some companies doing great things, people we're proud to have as customers, doing really great things, and thinking well. Thinking well. Because it really does boil down to, how are we thinking, what are we thinking about, what questions are we asking? In all the different phases of the customer's decision process, we have to be asking different questions to keep things moving. You see, it's interesting, you just talk about all the different phases of the customer's decision process, because that's what you know, but people don't think about that when they enter the decision cycle. Unfortunately, one of the damning stats that is out there right now, which I think is A) erroneous, and B) bad, is that buyers are X% through their sales cycle before they call the seller. That’s wrong, because then the sellers go, "Oh, there's nothing I can do now, because that's all that's going to happen." That's so bogus to me. It's so bogus, because in fairness to the folks who did the research, they say “On average in a small data set of folks.” There is no company on the planet that's going to change out their ERP system without getting help. They're just not. Yeah, because you need to be selling more than not buying. Exactly. I want to talk about AI, because that’s your big thing. You’ve been in the AI field before it was cool. Right now, there’s lot of talk about the need for fewer salespeople in the future, because artificial intelligence will replace them. Thoughts on that, where is it going? Artificial intelligence is very powerful when you're working with gigantic sets of homogenous data. If I'm Amazon, and I've got millions and millions and millions of people buying your book, SNAP Selling, Amazon can say, "When you buy SNAP Selling, you should also look at that, Selling to Big Companies.” you know? However, if you think about an enterprise B2B salesperson who, let's say they've got a million dollar quota and an average deal size of $100,000. So they have to win 10 deals to make their number. Let's say their win rate is 23%—which is average across the world for salespeople. That means they need to work 50 deals to make quota. That's what the math would say, yeah. However, that’s only a data set of 50, not five million. You can't derive patterns from a data set that small—even if you’ve got 1,000 sellers, since the number one variable is the seller. Interesting. I agree. The seller is the number one variable. It is, right? Now, you can go, "If Jill's on the deal, I really don't need to worry because she’s going to figure out how to get that deal done." You can’t just say, "Okay, AI doesn't work," because it does. But there are a lot of variables. Take that same seller who’s working those 50 deals. Let’s say they've got 20 people they need to interface with because the buying communities are getting bigger. It might be smaller, but at the enterprise level there are probably 20 people they have to get to. So now this one seller has 50 deals they’re working on times 20 people in each one. That’s 1,000 people they have to track. That's just mathematically impossible. People do it with spreadsheets and so on, but the software can learn a lot about those people and can help you remove all the graft. In my opinion, there's no job that exists in the world today that AI can't help with some task. It can replace some of the tasks, but it can't replace the job. Does that make sense? Yes, but I'm still stuck thinking about those 50 deals I have to close with a bunch of people on each of the deals. I can't keep track mentally of all that stuff, I can't remember every person, when I've met them, what they've done. I can't remember who I'm supposed to follow up with next. That makes me overwhelmed just thinking about it. Right, but it's true. And, remembering the stuff is one piece of it. The more important piece is prioritizing. Prioritizing, oh my God, yes. Who are the critical people—what I call in the book—the people that matter. Who are the people that matter? Of course, everyone matters in humanity terms, but in my deal, who are they. And how do I know? In my book, I guide people to those 10 or 15 questions I have to help them figure out if X is someone who has influence, who may or may not have preference for me, who is an innovator in how they think about things. Then I can say, "Of those 1000 people I've got to track, these are who’s most important. And here is how I should communicate with them, based on their attributes." The system can figure all that out and tell me, "Jill is a visionary, she's important; she has the ear of the CEO. And, in terms of what she said her business problem is, here's how we can map the specific capability of our product to solve her specific business problem that she has." That’s just a math exercise— a matrix of needs and wants and desires. And now you, Mr. Seller, go use your special sauce and your magic and your pixie dust to engage personally in this one. I prefer to think of AI as augmented intelligence, not artificial intelligence. Is there technology that’s doing what you just said—showing sellers their priorities and mapping them out, saying there's alignment here, telling me that this person is important to contact right now, and what to do? Absolutely, and more. Like here's who you should talk to and here's what you should say and here's what's going to appeal to them. And this person is the IT buyer, so they're going to care about security and performance and reliability. And that person is the HR buyer, and they're going to care about how the user is going to feel about it. Isn't that, "dumbing down" the sales force? I’m hearing that concern raised frequently these days. I think it's taking the drudgery away from the seller, and it's prompting the seller to go, "Oh, you know what? I never thought of that." It’s a bit like when you use Waze or Google Maps, and it shows you a way you never thought about before, and that just makes your life easier. It lets you focus on what’s really valuable, which is the thinking piece. With all that information and prompting, you can think about the strategies you’re going to use. Machines can't strategize for you. They can allow you to be creative, strategic, imaginative, and help you focus on how to apply your judgment. Machines are great at a bunch of things. Your computer doesn't get hung over, it doesn't get depressed, it doesn't stay home from work, and it doesn't quit a task. But when there's any creativity, imagination, judgment or personal interaction involved—that’s what the great sellers are really good at, and machines free them up to do just that. There’s so much pressure in sales organizations today. Sometimes it seems that all I’m hearing is a call for “more, more, more.” We need more calls, more proposals, more prospects in the pipeline. Personally, I think we need more thinking far more than we need anything else. Yes. I think we need fewer accounts too, and we need to think about the account. We need to understand what they're actually trying to achieve, and then we decide to help them. We decide to help them, which actually means we end up getting the deal. You can't do that if you're trying to do that by measuring activity and calls. Of course, we all have to do the work, but we have to do quality work. Donal, thanks so much for all your insights today. I have one last question. That book of yours is pretty detailed, it's insightful, but do you expect people to read it from start to finish? And, what are your thoughts on how to tackle that book? Because it's really for sales leaders and human beings who want to be ahead of this game—people who want to be leading the charge, as opposed to being followers. How can people use your book to get there? I'd like to think that people would dip in and out of it. It’s a large book, but if they start with the first section that talks about the customer's perspective and how they engage with the customer, and who their ideal customer is, then they get huge progress. Then they think about what their challenges are about, you know they need to create, build, elevate, expand relationships, so that's today's problem, let's go and look at the few chapters on that. Then they think about, "Okay, how do I enable all that in technology?" And in the last four chapters the focus is on accelerating velocity for less complex deals, maximizing the account and applying technology to grow it. One step at a time. People can dip in and out a bit as needed. Hopefully it'll be their constant companion as they're on their digital sales transformation journey. The truth of the matter is, you're always ahead of the game. So people can dip in and get started on the journey right now with you. As they progress, they can move to the next stage. If it prompts them to think a little, that'll be awesome. I think they will be thinking a whole lot after reading your book. Thanks so much, Donal, for being here today and sharing your brilliant insights with everyone. You're very kind, and it's always a joy. It's really my pleasure. I look forward to talking to you again soon.